With the closing of the Windsor arena, there’s still standing a building in Buffalo that may be the world’s oldest extant building to have hosted hockey, though much of the building has been altered to the point where it is unrecognizable. It was also a centre for the Mohawk Six Nations and the sport they excelled in – lacrosse. Inside the Broadway Auditorium in Buffalo this week. But in Buffalo there is a building older than both of those that briefly housed professional hockey. Today it is a garage for the city department of public works, used to store large trucks and road salt, and even in Buffalo few are aware of its existence. But that hulking structure was once the Broadway Auditorium, and it may be the world’s oldest extant building to have hosted hockey. The building dates to 1858, when it was built as an armory, although renovations and conversions may more accurately put the current structure’s date at 1887 or 1898. In 1910 it became the Broadway Auditorium, an arena for boxing, conventions, circuses and the like. It was there for the birth of box lacrosse in the early ‘30s; the Six Nations star Harry Smith played on its floor before he went on to Hollywood and greater fame as Jay Silverheels, Tonto in the “Lone Ranger” series. And for a stretch of less than one year, there was hockey at the Broadway Aud. The story is told on the Web site bisonshistory.com. In 1930-31 Buffalo already had a minor league team, the Bisons of the International Hockey League, ensconced at the Peace Bridge Arena across the Niagara River in Fort Erie, Ontario. But that year a second minor-league team arose — the Buffalo Majors of the American Hockey Association, the Midwestern loop with clubs in Minneapolis; St. Paul; Duluth, Minn.; St. Louis; Kansas City, Mo. ; Tulsa, Okla.; and Chicago. The Majors were going to skate at the Broadway Auditorium, where a 185-by-86-foot ice surface was to be installed. 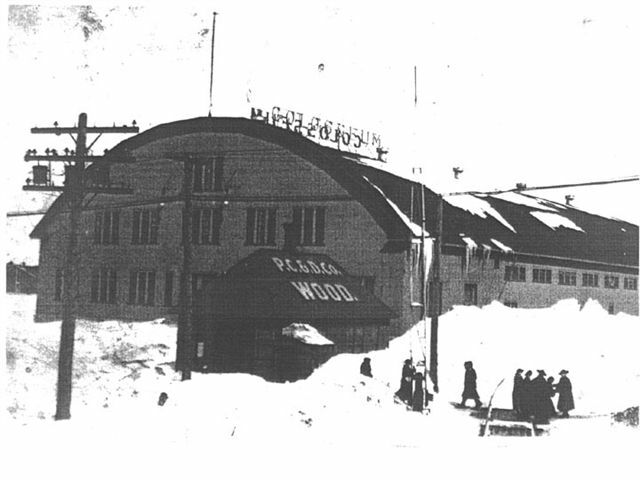 Completion of the ice plant was delayed past the Dec. 13 season opener, but it was finally ready for the game vs. the Duluth Hornets on Jan. 25, 1931. A packed house of 7,500 saw the Majors, wearing star-spangled sweaters that looked very much like New York Americans uniforms, rally from 0-2 down to a 3-2 overtime victory. At times the game was stopped because puddles had formed on the ice. An American Bowling Congress tournament was booked into the Broadway Aud for February, so the Majors played only six games there that season. But they went undefeated in those half-dozen contests on Broadway, culminating in a 2-2 tie with the Minneapolis Millers on Feb. 8. For their last 12 home games, the Majors paid the Bisons to play across the river in Fort Erie. The Majors returned for the next season, but the Great Depression was on in earnest. Poor performance on the ice, growing debts and crippling travel costs took their toll. The club played its last game on Jan. 20 and folded within two weeks. Thus ended the Broadway Auditorium’s brief period as a hockey arena. In 1940 Memorial Auditorium opened less than a mile away, atop the old Erie Canal terminus, and replaced the Broadway Aud as Buffalo’s civic arena. By the time it became home to the Sabres in 1970, the Broadway Auditorium had long since been converted to a D.P.W. garage. Memorial Auditorium was demolished in 2009, but the Broadway Auditorium still stands. That it was built no later than 1898 and still stands today with those dozen or so Buffalo Majors games in its past might make it the world’s oldest building to have hosted hockey, albeit with a big asterisk, of course. Last year the mayor of Buffalo, Byron Brown, suggested that the garage be torn down because he saw it as intruding on the Michigan Street African-American Heritage Corridor, which includes a church that was central to the abolitionist movement. But Brown seemed unaware of the building’s long history and its role in Six Nations sports heritage as a center of early box lacrosse. Nor did he seem to acknowledge that the building is still serving a useful purpose, unlike so many other buildings in Buffalo that stand vacant and disused; the estimated cost of a new D.P.W. garage is $25 million. 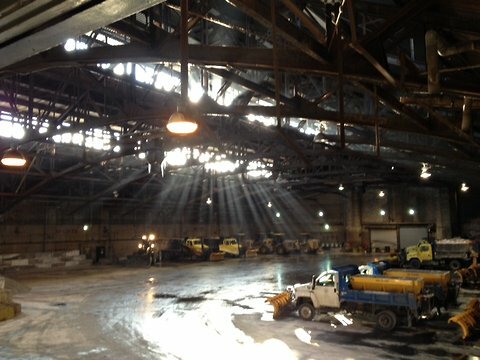 On Monday morning, it was snowing in Buffalo, so trucks were pulling in and out of the Broadway Auditorum’s vast, vaulted interior carrying road salt. There was no trace of the sports venue it had once been, but the arches and trusses that held up the roof and its sturdy brick walls made it look very much like the Windsor Arena beyond the other end of Lake Erie. 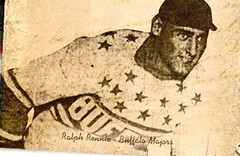 It did not take a huge leap of imagination to see the Buffalo Majors skating on a rink laid out on the ancient building’s floor, or fans in the stands, cheering and shouting, their cigar smoke curling up through shafts of light from the gallery of windows in the ceiling.